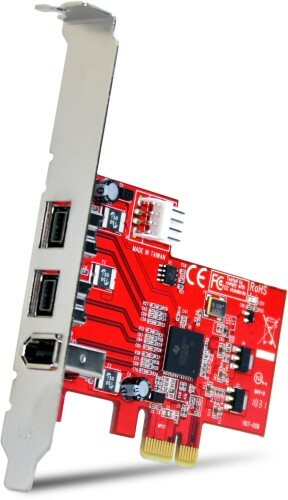 This PCI Express card provides two IEEE1394b (FireWire 800 - 9 pin) ports and one IEEE1394a (FireWire 400 - 6 pin) port, providing broad compatibility with a wide range of FireWire devices (e.g. DV camcorders, external hard drives, digital cameras, etc.). This 3 port PCI Express FireWire adapter card can be installed in a PCI Express slot to add two IEEE1394b (FireWire 800 - 9 pin) ports and one IEEE1394a (FireWire 400 - 6 pin) port, providing broad compatibility with a wide range of FireWire devices (e.g. DV camcorders, external hard drives, digital cameras, etc.). The 2b, 1a card features a native (single chip) PCI Express chipset - resulting in faster, more reliable and cost effective performance than expansion cards that utilise a "bridge" chip. There may be other low profile pcie firewire cards out there but this one had a full list of operating systems with both 800 and 400 ports, just what I needed. Used with Win 7 Pro 64 for a Nikon LS9000 film scanner and worked with nikonscan 4.0.3 and additional driver install. Very happy.